India captain Mahendra Singh Dhoni has retired from Test cricket. 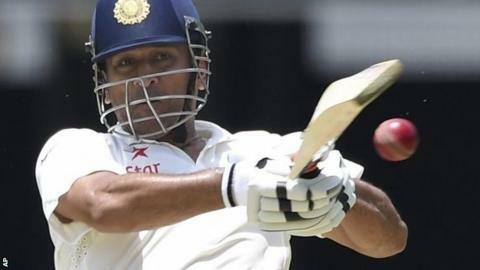 The 33-year-old, who made his debut in 2005 and was captain for 60 of his 90 Tests, quit after India drew the third Test against Australia on Tuesday. Dhoni has retired from Tests "in order to concentrate" on the 50 over and Twenty20 formats, with India's one-day World Cup defence starting in February. The Board of Control for Cricket in India (BCCI) called Dhoni "one of India's greatest Test captains". The statement added: "BCCI, while respecting the decision of MS Dhoni, wishes to thank him for his enormous contribution to Test cricket and the laurels that he has brought to India." Dhoni, rated by Forbes earlier this year as the fifth richest sportsman in the world with an annual brand value of £12.9 million, took over as Test captain from Anil Kumble in 2008 after leading India to the inaugural World Twenty20 title in 2007. India lost only one of Dhoni's first 13 Test series in charge, winning eight - a run that saw them top the world rankings from late 2009 until the summer of 2011, a period in which Dhoni also led his team to victory in the one-day World Cup on home soil. However, India surrendered their number one ranking with a 4-0 whitewash in England, a result that began their poor run away from home and after last summer's 3-1 defeat in England, Dhoni hinted he might stand down as captain. He will be replaced by Virat Kohli as captain for the fourth and final Test against Australia which starts on 6 January in Sydney. Record-breaking batsman Sachin Tendulkar, who quit Test cricket last year, tweeted: "Well done on a wonderful career in Test cricket. Always enjoyed playing together. Next target 2015 WC my friend!!" Former India captain Sunil Gavaskar told NDTV: "India will miss Dhoni big time because he gave a new dimension to Indian cricket. "Over the last year or so, the pressure of captaincy was probably affecting his wicket-keeping. The amount of cricket he was playing probably told on him."